To download AngularJS library, go to angularjs.org -> click download button, which will open the following popup. Select the required version from the popup and click on download button in the popup. You can also use the following online editors for learning purpose. We are using our own online code editor for all the AngularJS examples in these tutorials. Use any web server such as IIS, apache etc., locally for development purpose. 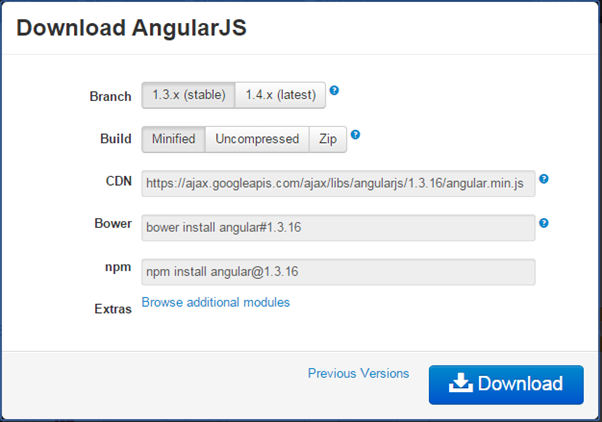 You can install any browser of your choice as AngularJS supports cross-browser compatibility. However, it is recommended to use Google Chrome while developing an application. Use Angular seed project to quickly get started on AngularJS application. The Angular-seed is an application skeleton for a typical AngularJS web application. You can use it to quickly bootstrap your angular webapp projects and development environment for your project. 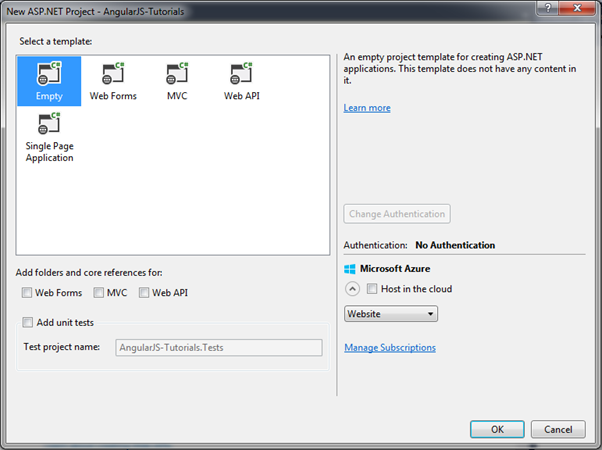 Let's setup Angular project in Visual Studio 2013 for web. 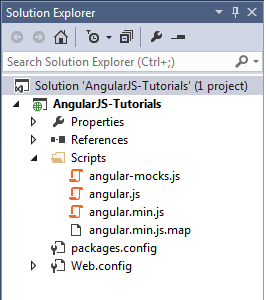 You can create AngularJS application in any version of Visual Studio. Here, we will use Visual Studio 2013 for web. First, create new project by clicking on New Project link on start page. This will open New Project dialog box, as shown below. Select Web in the left pane and ASP.NET Web Application in the middle pane and then click OK. 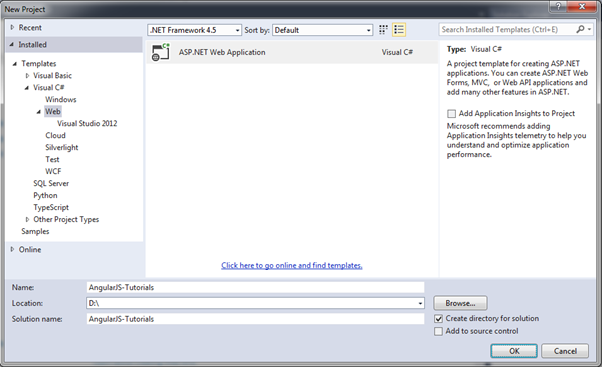 In the New ASP.NET Project dialog box, select Empty template and then click OK. 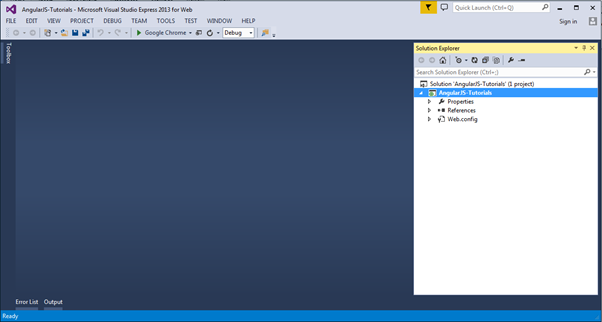 This will create an empty website project in Visual Studio. 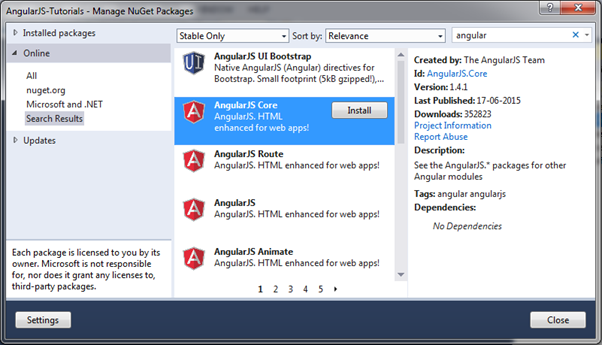 Now, install AngularJS library from NuGet package manager. 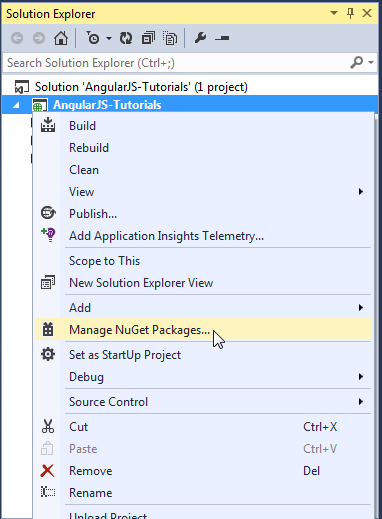 Right click on the project in Solution Explorer and select Manage NuGet Packages..
Search for "angular" in the Manage NuGet Packages dialog box and install AngularJS Core. This will add AngularJS files into Scripts folder such as angular.js, angular.min.js, and angular-mocks.js, as shown below. Now, you can start writing AngularJS web application. Create a simple AngularJS application and understand basic building blocks of AngularJS, in the next section.